Professor Frazer was kind enough to answer a few questions about this work. Contrary to the claims of secularists, they did not want to divorce or separate religion from public life; rather, they believed that religion was a necessary support. One should be very skeptical about general claims that begin with: “the founding fathers believed . . . ” or “the founding fathers thought . . . . “ There were Christians among the founders and there were deists among the founders and there were theistic rationalists among the founders—no legitimate claim can lump them all together. Apart from the extremists on the Left and the Right, I imagine there is a sizable swath of the American public that simply asks, “Who cares?” Obviously you think this question matters or you wouldn’t have written a 300-page book on it. So in your view, what difference does it make how one answers the question of the founding fathers’ faith? The question of the religious beliefs of America’s founders is important for a number of reasons in a number of categories. f) confidence is placed in processes and institutions rather than in the sovereign God—belief that the political system was originally Christian focuses and directs efforts of Christians toward correcting the political system and misdirects the resources of the church. For citizens, the competing claims of the Left and of the Right are based on their views/assumptions concerning the founding. Consequently, the false view of the secularists results in the loss of religious liberty under the false “wall of separation” notion promulgated by the courts. Also, theistic rationalism was the basis for the development of American civil religion, which has had a profound influence on most Americans and American traditions. For those interested in history or politics, I argue that one cannot properly understand the religious language in the Declaration of Independence without understanding the theistic rationalism of those who wrote it. Recognition of the theistic rationalism of those who wrote the Constitution and put it into effect is also vital to a proper understanding of religious liberty under the First Amendment and its proper application. Finally, proper understanding of the role of patriot preachers in promoting the American Revolution is impossible without an understanding of their theistic rationalism. All of these elements are, of course, explained in detail in my book. It is impossible to do them justice in this space. In terms of historical methodology, why do you give priority to private correspondence over public proclamations? The bulk of the evidence in my book centers on the private correspondence, diary entries, and personal memoranda of the key founders—rather than on public pronouncements. My focus is on what the key founders themselves said that they believed—rather than denominational affiliations or church attendance. My assumption is that individuals are most open and honest concerning their true beliefs when speaking privately in writings that they do not think will be seen by the public. Public figures know how to appeal to the public and say what the public wants to hear. But there is no need to do that in private writings; there they are free to be candid and transparent. In a number of cases, the key founders actually asked their correspondents to return the letter to them or to destroy it in order to keep it out of the public eye. Like today, denominational affiliations in 18th-century America were for politicians essentially club memberships and tell us virtually nothing about what an individual really believed. In his book The Faiths of the Founding Fathers, David Holmes investigates four areas to determine a founder’s faith: (1) religious activity (e.g., church attendance); (2) participation in church sacraments (baptism and the Lord’s supper); (3) comparison of religious inactivity and activity; (4) use of religious language. He concludes that they can be broadly classified as non-Christian deists, deistic Christians/unitarians; and orthodox Christians. How does your methodology and conclusion difference from this? 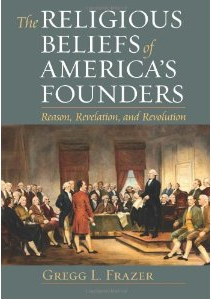 As the title of my book suggests, my project was to determine the religious beliefs of the key founders, so I was not very concerned with public activities—except in cases in which an activity would have been unpopular or controversial or somehow gives insight into actual belief. Consequently, my only interest in church attendance is to show some interest in Christianity and to trace the frequency of church attendance when the public is watching compared to when it is not. As for the sacraments, I find Washington’s steadfast refusal to take communion and Hamilton’s intense desire to do so after his conversion to Christ (but not before) to be very informative. I consider their use of religious language to be absolutely crucial. There is no other way to get at what they really believed. What language did they use in public versus private? What terms for God did they use? Did they use specifically Christian language or generic “religious” language? A matter of language that is critically important is to determine what they meant by certain terms. Too often, for example, Christian America advocates simply cite quotes in which founders refer to “Christianity” or “Christian” and leave the false impression with Christian readers/listeners that those words meant the same thing to the founders as they do to them. But key founders such as John Adams, Thomas Jefferson, and Ben Franklin meant something very different by those words. They created their own versions of “Christianity” that bore very little resemblance to its actual or common meaning. Other words such as “bigot” had very different meanings in the 18th century than they do today and proper understanding requires recognition and explanation of that fact. A centerpiece of my argument is my conviction that the terms “Christian” and “deist” have been so broadly applied to the founders that they’ve become virtually meaningless categories. This is largely due to the fact that those two categories have been the only generally accepted niches, so individuals have been shoehorned into one of those identifications whether they fit or not. I carefully define both terms to provide boundaries that would have been recognized in 18th-century America in order to produce more accuracy—more truth in labeling. Holmes’s conclusions seem to me to illustrate my point perfectly. While we do not deal with exactly the same people, Holmes covers five of the eight persons I class as “key founders.” In common with virtually everyone (except me), he calls Jefferson and Franklin deists. Along with many scholars, but not necessarily a majority, he also calls Madison a deist. But his determinations regarding George Washington and John Adams highlight the “shoehorn” activity mentioned above and particularly point to the need for my work. He calls Washington a “Deistic Episcopalian” and Adams a “Christian Deist.” In 18th-century terms, these descriptions are nonsensical—and they do not stand up to the evidence. What will be some key surprises readers will find in your book? h) far from erecting a wall of separation between church and state, key founders including Jefferson attended worship services in the House chamber of the Capitol building.